Once upon a time there was a baker who turned bands into cookies. It’s been a while since I’ve ventured into that cookies-based-on-a-band world. Usually, I kept my sights pretty limited to The Airborne Toxic Event. Sure, I had that one brief post devoted to The Limousines, but let’s get real. Those cookies sucked. (Don’t worry Eric and Gio, I’ve got a plan to make it up to you.) There was also my short glimmer of genius when I made Matt and Kim dance, but it was long ago and only lasted 30 seconds. 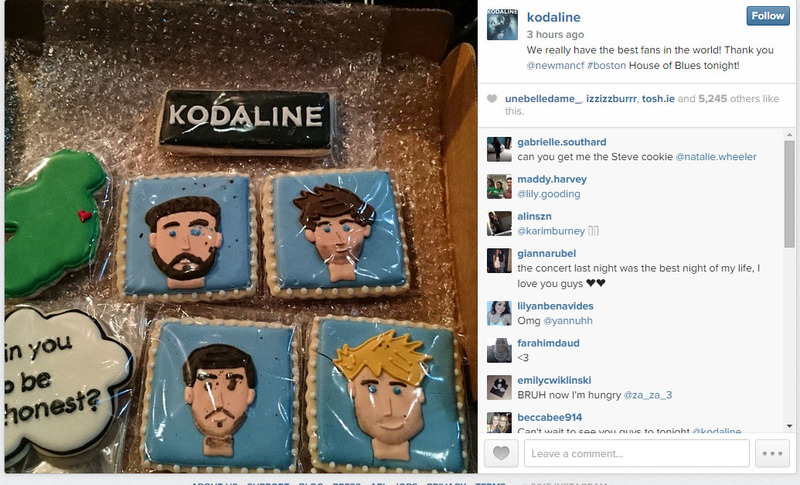 So when a client asked about cookies for one of her favorite bands, Kodaline, I wondered if I could live up to the challenge to magic happen. Maybe I would be able to channel something great because they were one time an opening act for TATE? Seemed like a stretch. Or could I fall in love with their music to make the icing would flow from the fingers. There wasn’t enough time to delve deep into proper fan obsession. Or probably, and most realistically, I could create something because I’ve seen tons of fan love for them on my Facebook feed and understood how it important it is to them. It was time to research. I was lucky. The client was hella cool and let me pick what I wanted to do. This is a gift and a curse because what if you don’t live up to expectations? What if your package shows up and they’re like “Meh.” It needed to be something fun. Some spectacular. Something that truly screamed fan love. I knew from the beginning I wanted to do the band. (That’s what she said. You knew I had to, right?) As I’ve admitted before, I’m a terrible artist. This would be no Mona Lisa on a cookie. Luckily, they have pretty distinct faces. And facial hair. I thought I could make cookie renditions that pick up on the things which make each unique. The accompanying cookies also needed to mean something. There name had to be there, but what else? Since they are from Dublin, Ireland and I love that damn city, those were a no-brainer. And then I needed something for Courtney. Something meaningful for the lovely lady who requested the tribute in the first place. For her, I piped the song lyrics she loves the most. 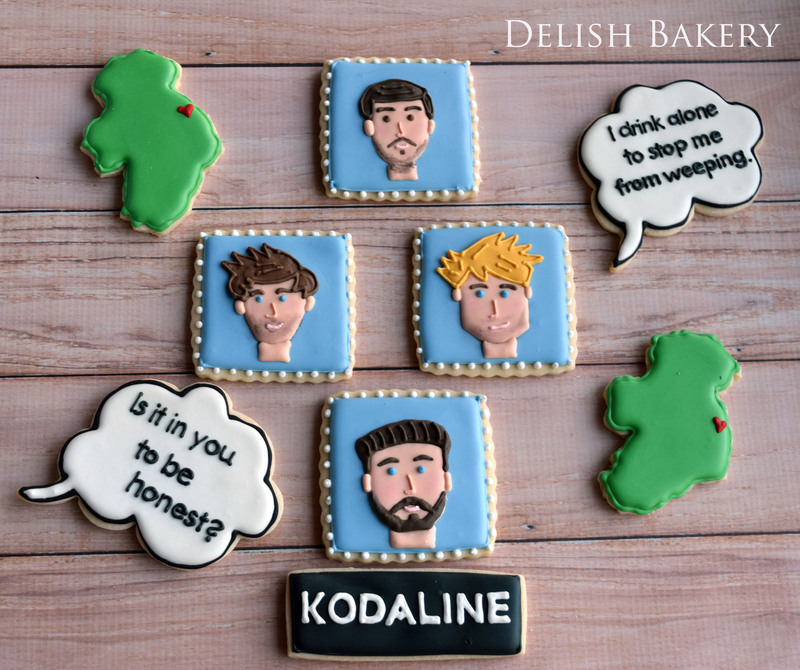 This is how Kodaline cookies, AKA Koda Kookies, came to be. Now you can match them to their faces. Or you could go look them up. Yanno, give their music a try and say it was all because of Courtney’s cookies. Our wonderful client Courtney delivered cookies to her fair princes in Boston. The band recognized her lovely fan devotion with a public declaration. And they lived happily ever after. * The End. *I just watched the Cinderella movie and now I will talk in “narrator” always.